MISHMERET, Israel (Reuters) - Israeli Prime Minister Benjamin Netanyahu cut short a visit to the United States on Monday and the military dispatched reinforcements to the Gaza border after a rocket attack near Tel Aviv wounded seven people. Netanyahu threatened a forceful response to the long-range strike amid accusations from opponents in a closely contested Israeli election, two weeks away, that he had been showing weakness in the face of security challenges from Gaza militants. Netanyahu, who arrived in Washington on Sunday for a four-day visit, said he would fly home right after meeting President Donald Trump at the White House, as planned, later on Monday. "This was a heinous attack on the State of Israel and we will respond strongly," Netanyahu said in a video statement. The Israeli military said Hamas, the armed group that rules Gaza, fired the rocket that destroyed a house in Mishmeret, a village north of Tel Aviv. There was no claim of responsibility for the early morning strike. The military said Hamas launched the rocket from about 120 km (75 miles) away, making it the longest-range attack from Gaza causing casualties since a 2014 war. Calling the strike "absolutely unacceptable", U.N. Middle East envoy Nickolay Mladenov said on Twitter the "situation remains very tense". A Palestinian official, familiar with Egypt's efforts to broker a long-term ceasefire between Israel and Hamas, said Egyptian security officials "are working to restore calm - they have been doing so before and after today's rocket". Israel's Magen David Adom ambulance service said it treated seven people, including an infant, a 3-year-old boy, a 12-year-old girl and a 60-year-old woman who was suffering from blast injuries, burns and shrapnel wounds. "It just made me feel really unsafe all of a sudden, which is a feeling I'm not used to," said Nitzan Shifrin, a 19-year-old Mishmeret resident. 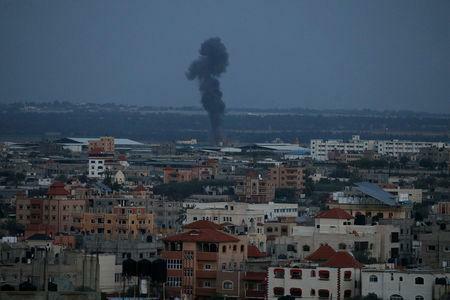 The Israeli military said it was assigning two brigades to the Gaza area and some reservists were being called up. Reuters witnesses saw troops moving towards the border, where the military also closed several roads to civilian traffic. In Gaza, Palestinians were bracing for retaliation as Israel closed its border crossings with the territory and access to the sea. The rocket attack coincided with tension ahead of the March 30 anniversary of Gaza protests that have included Palestinian attempts to breach the frontier and often lethal Israeli fire. Gaza authorities have said some 200 people have been killed by Israeli fire in the protests. An Israeli soldier was killed by a sniper along the frontier. The protesters demand the right to return to land from which their ancestors fled or were expelled in fighting that accompanied Israel’s founding in 1948. Israeli-Palestinian peace talks have been frozen since 2014. Some commentators in Israel also drew a link between Monday's rocket fire and recent street protests in Gaza against higher prices, demonstrations which the U.N. said triggered a Hamas campaign of arrests and violence. "Having failed to quell the protests with a violent crackdown, Hamas chose a new tack. What better way to distract their public, and turn their ire away from Hamas and back toward Israel, than to provoke a heavy Israeli response?" Dan Shapiro, a former U.S. ambassador to Israel, wrote on Twitter. Two rockets were fired at Tel Aviv on March 14 but caused no injuries or damage. Israel blamed them on Hamas, though a security official later said the salvo was set off by accident. Palestinians in Gaza have also frequently launched incendiary balloons towards Israeli farms and villages along the frontier - attacks that have triggered Israeli air strikes, at times against Hamas facilities abandoned in advance. Netanyahu's visit to Washington, after Trump said it was time to recognize Israel's sovereignty over the Golan Heights, an area it captured from Syria in a 1967 war, was seen at home as a bid to boost the Likud leader's chances of a fifth term.